When my kids were little, and their favorite holiday was Halloween, I thought- if I make something the kids really like, they will actually eat dinner before they go out and fill up on sugar. They all loved home made chicken noodle soup and scones. So began the tradition. I don’t use a recipe- just mix together water- to make chicken stock, throw in some chunky carrots, celery, onion, seasoning and chicken. Simmer for a long time, strain off the fat, add some noodles…that was it. I found a recipe for Crock Pot Chicken Noodle Soup, and thought it sounded good. I think good chicken noodle soup needs tarragon, and lots of chicken flavor, so I modified a bit. Try it- I think you’ll love it too. Place all ingredients except noodles in crock pot. Cover and cook on low for 5-6 hours or on high for about 3 hours. Remove chicken and bay leaf. Take meat from bones, shred or dice, and return to broth. Add the noodles. Cook for another 30 minutes to an hour, or until noodles are done. Or, cook the noodles separately and add just before serving. Add chicken flavoring to taste. Do you know about how many this will serve? I need to make enough for 12-14 adults. I can double it and do two crock pots if needed. This soup recipe will serve 10 adults. Try one of my bread recipes to accompany this soup! Perfect for a chilly autumn dinner! What would your cooking recommendations be if cooking in an instant pot? I Love all your recipes, thanks so much for sharing! Try this: Turn IP to sauté mode; sauté carrots, celery and onions for 5 minutes. Add spices and sauté for 1 more minute. Add broth, water, and chicken. put the lid on IP and with the seal in place and turn to the locked position. Set the timer for 20 minutes in manual or high pressure mode. Naturally release pressure for 15 minutes. Manually release the remaining pressure. Carefully remove chicken, take meat from bones, dice and return to broth. Cook noodles seperately and add just before serving, or turn IP to simmer and cook noodles in broth till tender. Add chicken flavoring to taste. Let me know how this recipe works for you! I usually dissolve 2 tubs of the Knorr Homestyle Stock into soup and taste is perfect. I only have 1 tub. Could I add a little of Better Than Bouillon chicken Base to substitute for the other tub I don’t have? Sorry I missed this earlier Kimberly, yes that works! I usually stock up when I find the Knorr’s because it’s a little difficult to find. As an FYI I found it at Walmart at Christmas time and bought enough for a year (hopefully!). Does this need be used with chicken on the bones? 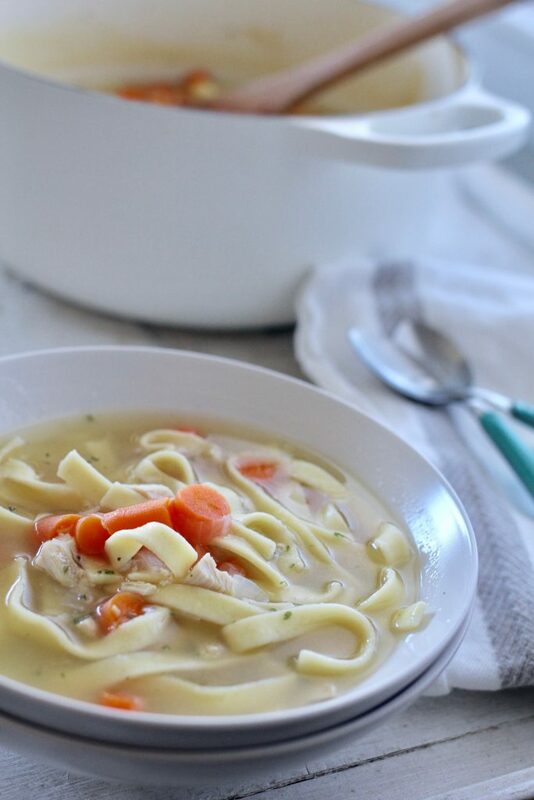 I’m planning on making your rotisserie chicken and was hoping to make this soup with the leftover chicken. Hi Julie, you don’t have to make it with the bones, you can just add your leftover chicken and it should turn out great. Thanks for asking and for reading ABK!